What Have the Malls Turned Into? When Virginia Center Commons opened in 1991, it was beautiful. And special. A real eye opener. And a popular place to shop. Today it looks a bit tired. Closer to dead, truth be known. Sure, the custodial staff does a great job of keeping it clean, but cleanliness isn’t the only thing necessary for keeping a mall alive. Especially if it lacks sparkle otherwise. In all fairness, the state of the economy probably has a lot to do with the condition of Virginia Center Commons–and many other malls as well. In a recent walk around VCC, I used a scrap of paper to help me keep count of the number of empty stores. Twenty-five, including three places in the Food Court. The not-overly-large-to-start-with Food Court. And that’s not counting the decreased number of kiosks in the middle of the various hallways. No more shoppers than I normally see there on my frequent walks–at least black Friday was an exception–it’s no wonder so many stores have closed. Competition for a small number of shoppers must be brutal. I marvel at the existence of five jewelry stores, several of which seem to have permanent liquidation sales going on. But some people are enterprising in the way they use the mall. 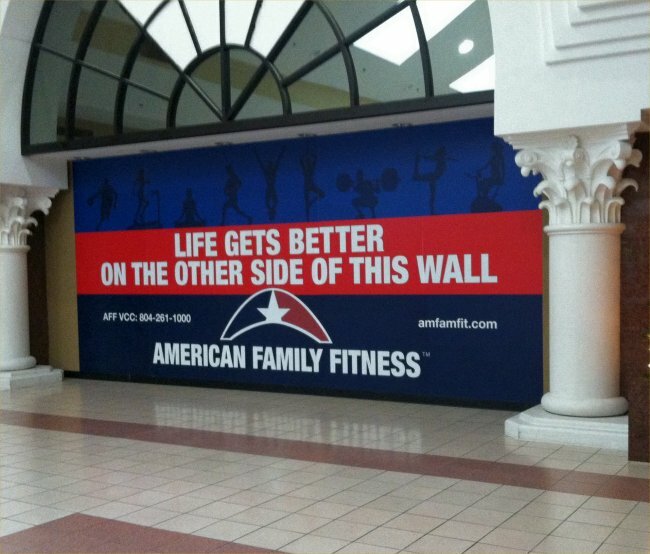 American Family Fitness opened a full-size place, complete with pools. 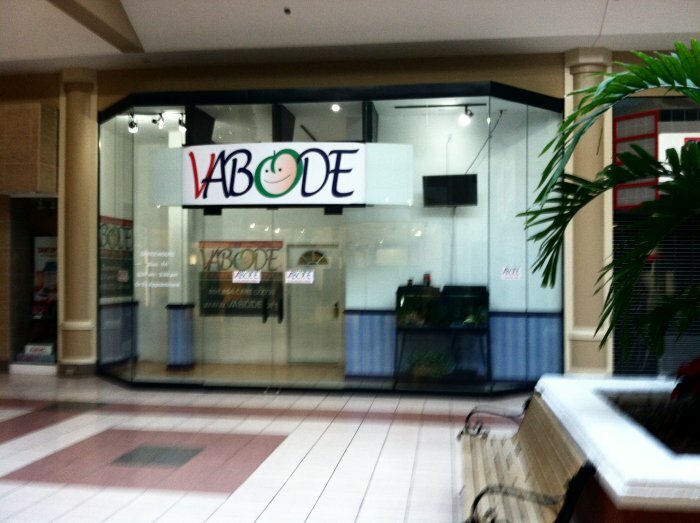 It began in a limited fashion where an Old Navy store had closed. The building of the full facility took forever. Interestingly, even though the AFF is attached to the mall, it’s not accessible from within the mall. Not even any windows for mall shoppers to stare at the exercise-hungry through. 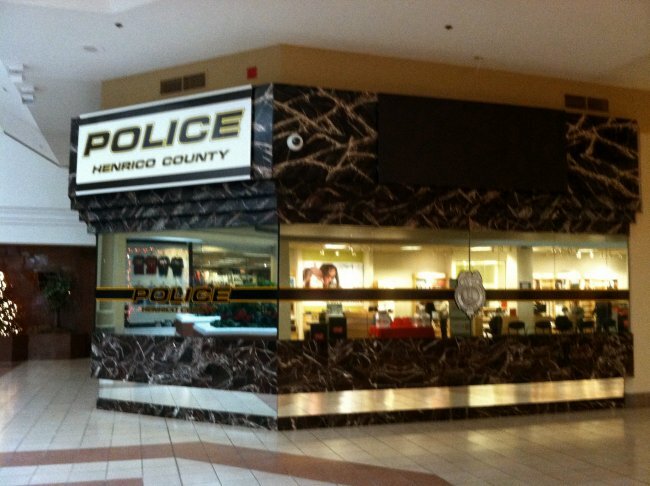 I couldn’t believe my eyes when a Henrico County Police substation opened in a spot long empty of the jewelry store that used to occupy that spot. Next came a counseling office. I’ve never seen anyone coming or going there–there’s a solid door several feet inside the glass door–but the fish in the aquarium in the window are alive, so at least somebody is feeding them. Then came a dentist’s office. 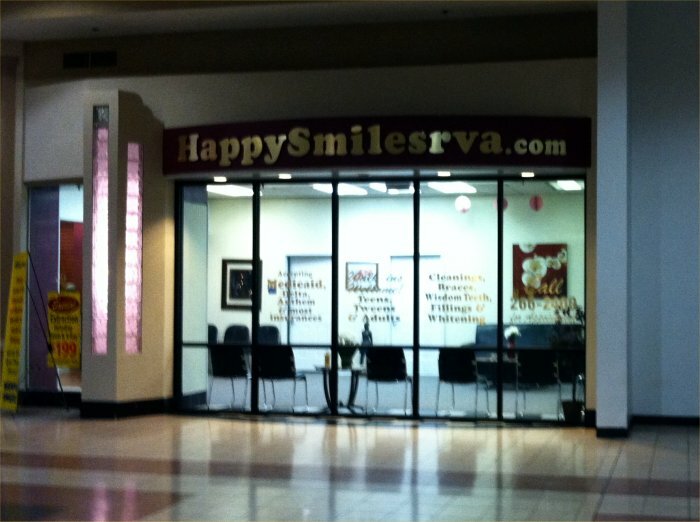 Appropriately for a mall, they take walk-ins and are open at different times from a normal dental office. The government is really pushing Obamacare. 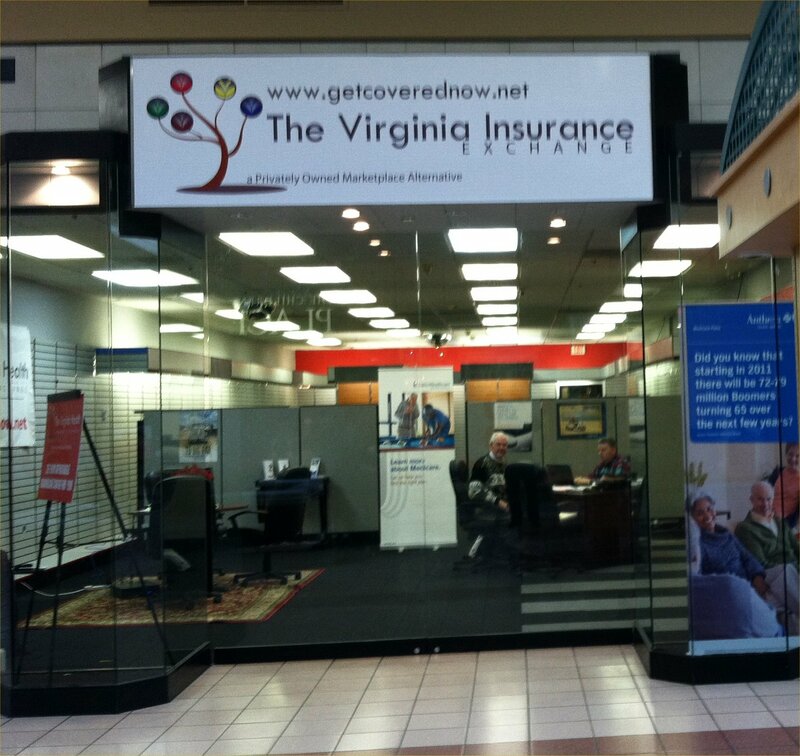 One former store now houses someone whose job (apparently) is to sell people on the affordability of Obamacare. Good luck on that. Most recently came the seasonal use of one store. 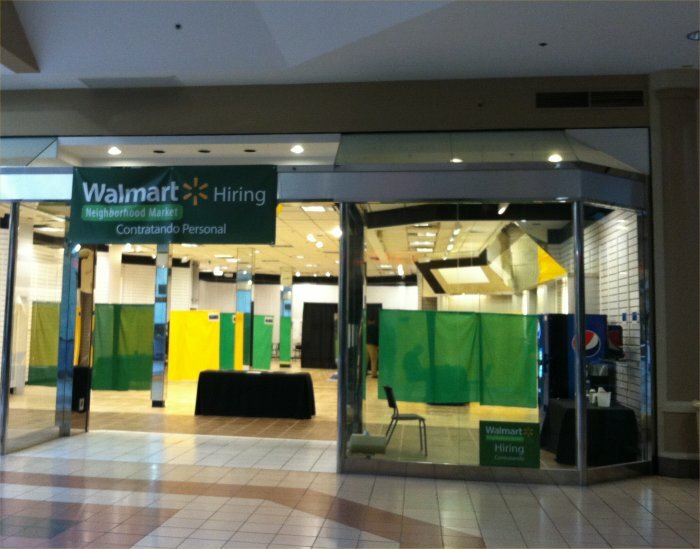 WalMart–VCC is about five miles in either direction from a WalMart–has set up a number of computer terminals for people to use to apply for work at WalMart during the Christmas season. If Virginia Center Commons can’t sustain itself in normal ways, may it continue to do so through unusual ones. This entry was posted in Malls, Virginia Center Commons and tagged As I Come Singing, On Aging Gracelessly, Roger E. Bruner, Unusual use of malls. Bookmark the permalink. Bogotá is a city of malls… Between the 9 million inhabitants there has to be at least 40 nice sized malls, many which would rival a new, sparkling US mall. I have a restaurant in a mall here. To give you an idea of how it is, my rent is 500,00 pesos a month (250 dollars US). In any of the nicer, new malls rent on the same sized space runs about 15,000,000 pesos a month ((7,500 dollars US) SO I’m in a ghetto mall that at one time was the Casbah of shopping in Bogotá. We have the same problem of vacancy with about 20 places shuttered. In the food court there are at least 6 empty locations. I opened here primarily because of the cheap rent and secondly because there is an abundance of physicians who have offices here and nearby. Also, there are a lot of banks which brings in a steady stream of folks who like to eat. Sure, I’d sell way more food paying 15 times as much rent but I’d work myself to the bone to make somebody else rich. SO I elected the quieter, less affluent setting which enebles me to enjoy my cooking without the stress of having to pay so much rent. I didn’t move to Colombia with the idea of getting rich bt rather to enjoy life. And that’s what I’m doing. Tom, thanks so much for sharing. I’ve always wanted to know more about your restaurant, but wasn’t sure what to ask. Roger: You ask the questions that interest you. We finally put up a sign today, 11 months to the day since we opened. Up until now I let my food do the talking. and it did well. Up until now I had RIb joints. we did other plates but nothing complicates: chicken, fish, burgers. all did well but cooking ribs is not a dificult thing to do: you put them near a heat source and walk away for 20 hours and come back ad they’re done. in this place, as it’s a lunch only service i had to really start getting creative and develop my own recipes that included food the locals like to eat. a big hit here is Jambalaya. We did it yesterday. i think the plate that smashes people here is the one I did today called ”Bull in the Garden.” I take a large chuck roast, (well, six of them) and slice them up into small steaks. Then I sear them on both sides with salt, pepper and garlic. Then I put them in a braising vessel and stick them in a 500 degree oven and turn off the oven and go home for the night. when I come in in the morning they are still warm and have cooked ot a melting, soothing texture. I take them out of the braising liquid which I then turn into a soup. When a customer orders the plate I take the soft, jucy steaks and pan fry them. Oh my. Then I plate them next to glazed carrots, peas with onions, corn and bell peppers in a butter sauce and some potato. People freak out. We sold out so quick I disappointed a few people.. I’ve done this with a number of plates and now I have about 50 different main courses apart form another 75 side dishes. But as we’re small I ususally just pick one main dish each day and add it to the standard menu of Baked chicken, fried fih filet, grilled pork tenderloin and a pasta. Real american comfort food.